As a visceral person who loves film, I am easily moved when I watch productions that connect the struggles of human beings with the vicissitudes of life. This week I watched such a creation and its’ genius was that it led me to thoughts larger than the particular subject of the program. Hubris is an ancient Greek word that can be thought of as indicating: “a loss of contact with reality and an overestimation of one’s own competence or capabilities, especially when the person exhibiting it is in a position of power”. http://en.wikipedia.org/wiki/Hubris . To the ancient Greeks, hubris played an important part in their philosophy and in their philosophic expression in Greek dramas. In those times sexuality was also deeply intertwined in its examples. However: “In its modern use, hubris denotes overconfident pride and arrogance; it is often associated with a lack of humility, though not always with the lack of knowledge.” I intend to extrapolate from one desperate time in American history a sense of what fault it exposes in a macro-cosmic human sense. Along with the “Great Depression” in the United States, an ecological disaster occurred and added to the general economic misery of the country. 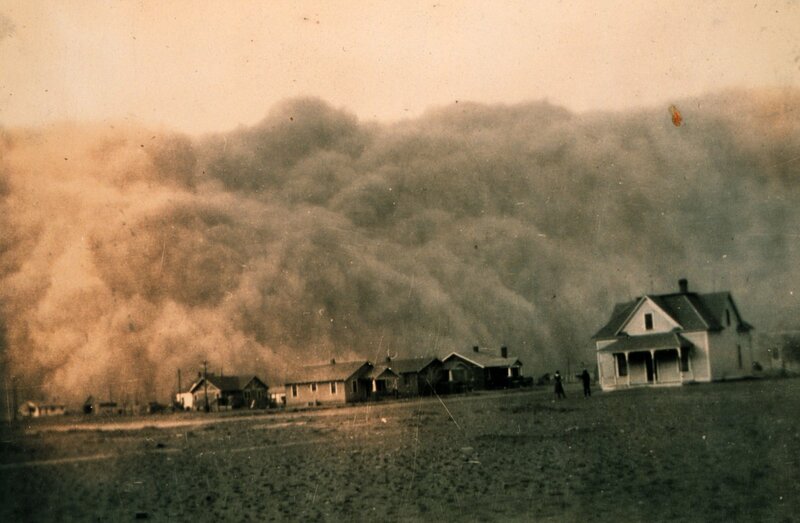 This was the advent of the “Dust Bowl” in the agricultural “heartland” of our country. The documentary I watched was “Ken Burns: The Dust Bowl” which I’ll link at the end of this guest blog. From 1930 through 1940 immense dust storms, with ever increasing frequency, began to plague this area along with a parching drought, devastating this formerly fertile region. As the farming economy shrank, children died and farm folk were driven into despair, it became apparent that this ecological disaster was brought about by the people who had worked the land into becoming among the most productive farmlands in the world. I watched this documentary, tearing up frequently at the human misery I saw and clenching my jaw in anger at the sheer cupidity that caused it. I was rediscovering a part of our history that I had known little about except for where it happened. By retelling this tale though I want to make a larger point. The Greeks had it right about humanity in general, in that as we have become masters of this planet, so many of us have so often been laid low by the hubris of thinking ourselves completely in control of our world and immune to the effects of nature. 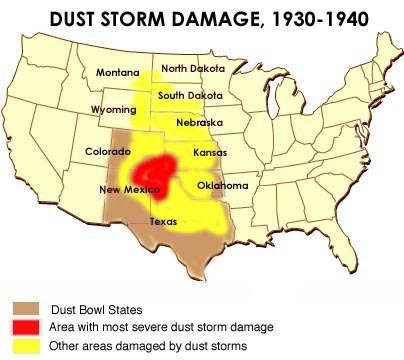 The map above shows how much of our country was directly affected by the “Dust Bowl Climate”. The center of the storm activity was at a small farming community known as “Boise (pronounced “boys”) City, Oklahoma”. First let me relate the history of this deadly phenomenon and then I’ll draw conclusions as to my belief that it is a metaphor for humanity’s hubris developed by our being the most powerful life form on this planet. Before people emigrated in great numbers to this area of the country it was covered with “Prairie Grass”, innumerable bison and Native American Tribes. It was a beautiful Eco-system, similar to the Russian Steppes in its fertility and in the viability of its ecosystem. “The Prairie Grass” had through eons of evolution become the hardy plant that held the rich soil together by extended roots reaching down into the plentiful moisture below, thus supplying life sustaining water to the vegetation of this relatively arid region. The millions upon millions of bison added to this ecology and it reciprocated. The Native American tribes lived with and off the “buffalo”, in a manner that befitted fauna’s interaction with an ecosystem to the mutual benefit of its ecology. The incursion of American hunters and settlers began in the 1840’s, but did not become a problem for the Native tribes until after the Civil War. “Buffalo Bill” Cody was given that nickname during the Civil War when he contracted to supply buffalo meat to the Union Army. Prior to this, treaties signed in 1834 had acknowledged that this was to be lands solely for the use of the various native tribes and it was deemed the “Indian Territory”, though reduced to a size approximating today’s Oklahoma. It was not incorporated into the United States, meaning the natives had sovereignty. Cody’s success with supplying the highly nutritious buffalo meat had brought other hunters to the area. A thriving commercial operation started and the Native Americans seeing the slaughter of the animals increase exponentially began to attack the hunters and the few farmers that had encroached on their lands. The bison though were slaughtered almost to the point of extinction putting the Native Americans into a precarious ecological bind and thus fighting back against the incursions. This resistance led to the U.S. government sending in the U. S. Calvary and General George Armstrong Custer. You know how that wound up. This was to be followed by several more “Land Runs” over the next decade as thousands came to Oklahoma to take up farming and or cattle ranching. The farming predominated and the “Prairie Grass” was being uprooted to make way for golden stalks of wheat. By the time of World War I, Oklahoma was producing immense wheat crops and empty land, some of it hardly fit for cultivation was being hawked back East to people hungry to move up in the world by owning their own land. It was your typical land boom scheme and surprisingly some of the swindles were so brazen and the land they sold so worthless, that the perpetrators actually went to jail. When the U.S. entered World War I the price of a bushel of wheat needed for our Armed Forces doubled to two dollars. This brought it City Folk known as “Suitcase Farmers”. They would ride in by rail. Buy up land. Pay people to farm it to its limits, go back home and then return for the harvest. Their interests weren’t to live on the land, but to exploit it to its fullest potential. Plowing that used to be done by creating furrows that captured water, while limiting erosion, was replaced by a plowing method that destroyed the cohesiveness of the soils ability to fight erosion. However, this new method provided for even greater crop yields in shorter time periods. This more environmentally destructive method was also adapted by regular farmers greedy for increased profits, even though they knew that it was destructive. After World War I the price of a bushel of wheat fell to about one dollar. To make up for the lost income, production was doubled by farmers and throughout the 1920’s the harvests became increasingly plentiful and the farmers became prosperous and land values rose. For this region the “Roaring Twenties” were the “Golden Twenties” as well. Even the start of the Great Depression in 1929 did not at first affect this region and in 1930 it was considered one of the United States’ most prosperous areas. “The unusually wet period, which encouraged increased settlement and cultivation in the Great Plains, ended in 1930. This was the year in which an extended and severe drought began which caused crops to fail, leaving the plowed fields exposed to wind erosion. The fine soil of the Great Plains was easily eroded and carried east by strong continental winds.” http://en.wikipedia.org/wiki/Dust_Bowl . The first great Dust Storms began in 1930 and continued to increase in frequency until April 14, 1935 when the area was hit by a storm of much greater magnitude and destructiveness than had previously occurred. http://video.pbs.org/video/2250514396 . The effects of this storm weren’t confined to this region but spread east across the country to the Atlantic Shore. From this devastation’s wake, the entire country and the Roosevelt Administration had a vivid demonstration that this was a threat to the entire nation and not just one specific area. FDR’s administration had been targeting programs and resources into this problem from almost the beginning of his taking office in 1932. Primarily it was hunger and shelter assistance, with the provision of public works jobs through various New Deal programs like the WPA. http://en.wikipedia.org/wiki/Works_Progress_Administration The New Deal also promoted a scientific farming program that discovered how wheat could be grown with much greater care for the land and which would effectively forestall soil erosion. This was gradually adopted by farmers towards the end of the 1930’s, though not without opposition to the use of new techniques. We also know of the history of migration to the West coast from these areas by people who were called “Okies”, although they didn’t just come from the specific Dust Bowl areas. Their mistreatment at the hands of the fellow citizens was brought home in John Steinbeck’s classic novel “The Grapes of Wrath” and in the songs and activism of Woody Guthrie. In the Burns film one thing that brought this ill treatment home to me were the various signs put up in California in that era that proclaimed: “No Niggers or Okies” allowed. The brutality with which these migrants were treated at the California and other Western States borders was indeed the equal of “Jim Crow” excesses in the South. With the end of the Dust Storms and the beginning of World War II and the need to feed the Armed Forces, this areas area again prospered and the “Suitcase Farmers” returned, this time though in the guise of huge Agra-business firms. Although the end purpose of those who live on the land as farmers and the Agra-Business industry are the same aim of making a profit, those who live on the land see themselves as stewards simply because they are trying to create a future for their children. The land therefore is their “heritage” to be nurtured and continued through generations. Agra-Business views the “land” through “corporate eyes” as a resource and profit center to be used to extract the greatest amount of return o their investment. While the lessons of proper plowing were indeed learned, the persistence of drought in these areas, caused the search for new ways of irrigation. Thus the huge Ogallala Aquifer is now being tapped to maintain a constant water supply. Many environmentalists have commented on the drop of the water levels throughout this hugely important water source. This is only a finite source of water and the ever growing usage and depletion of it portends a future where fresh water, the essence of life, becomes a sought after and ever decreasing commodity. Many predict that the Wars of the future will be fought over fresh water supply. So while for now this region has conquered the problem of the “drought cycle”, In the future this solution appears to again be threatened by the depletion of the Aquifer and our belief in our human ability to conquer all adversity and thus only think in the ego gratifying short term, will again merely be a manifestation of our hubris. I felt I needed to go into the Dust Bowl in depth in order to give the reader background the essential thought, these two documentary programs brought to mind. Humanity has for thousands of years preened itself with the concept that we are “Masters of the Earth”. Many of our religious traditions posit that this supremacy is a “gift” that God has bestowed upon us. With this “gift” we are risen above our environment and it is not a place where we live, but is our realm, to do with as we please. When we see a natural calamity like “Super-Storm Sandy” wreak havoc on perhaps the most infrastructure intensive area in the nation, our horror boils up, but in truth these are important lessons that get quickly forgotten as the clamor for progress, profits and proliferation echoes with a steady drumbeat. This is in effect the Hubris of Humanity. We ignore the truth that we are but advanced animals, technologically proficient, but still able to be laid low by the catastrophic and uncontrollable forces of nature. We don’t just ignore our place as part of an environment, we disdain it with the belief that we are so powerful an entity, so unique, that we can overcome the mere demands of the ecology we live in. This to me is the definition of Hubris and it is a fault of humanity and not just the United States. 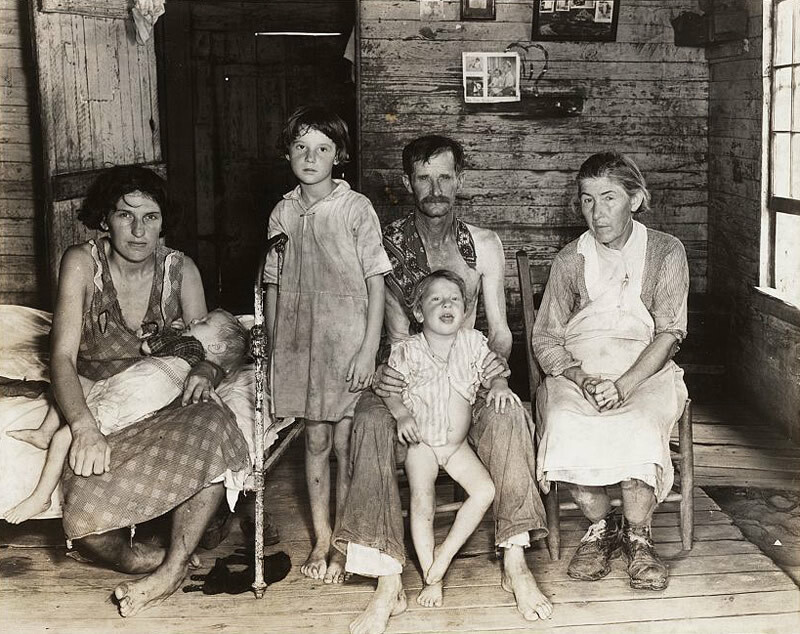 The desire for land, status and profits motivated those masses coming into the territory that became the “Dust Bowl”. I don’t fault them for their desire to make their way to a better life for themselves and their children. I do fault them for not understanding the forces they unleashed and how their pride in their accomplishments could so easily be made naught because of their unwarranted belief that their environmental conditions would always be the same. Their success led them to believe they were capable of overcoming anything as individuals only responsible to themselves and their families. The idea of intelligent farming, husbanding the land, is perhaps ten thousand years old. For many humans the tradition of farming has been handed down for generations and with it the knowledge of the need for humans to be humble before nature. Simply the understanding that Nature is far more powerful than we. Humans that forget this truth are doomed by their Hubris and in its throes doom us, as the Greeks well understood more than 2,000 years ago. These are the links to the two-part Ken Burns documentary “The Dust Bowl”. Self-organization, be it abiotic or biotic, is still not the equivalent of conscious intelligence. It’s probably a precursor, but to think that it is equivalent is a false equivalence. Dredd, sorry, I agree with you. It was ‘snark’. You know, those quacks with no sense of sarcasm. snarkasm. My snark detectors have had a busy day. Sorry I missed the snarkasm.